2. Computer users wanting to learn useful tips and tricks that will last a lifetime. 3. Computer users new to Windows 7, Windows 8/8.1, or Windows 10. 4. Existing Windows users looking to learn the essentials. 5. People who are always looking to increase their technical knowledge. Everywhere we look today, there are now computers! These computers come in all sorts of sizes and types, from handheld devices to desktop systems. They have greatly changed the way we do things in our everyday lives. They have added convenience to our daily tasks, have enhanced our education, and have provided many fabulous money making opportunities and jobs. The current trends in computer purchases and the number of people joining the online community suggests that computer usage will continue to grow at a steady rate and continue to change the way we do things. 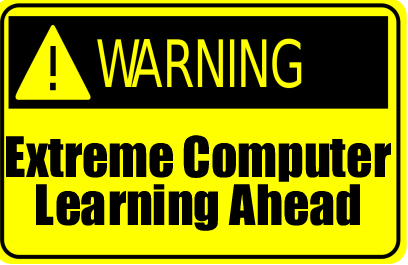 Thus, computer education is now more important than ever before. As professional computer consultants with over 20 years in business, we at Coronel Data Processing have discovered that 80-85% of all computer related problems are due to user. The other 15-20% being hardware or software related. The user problems can be as simple as not being able to correct a simple printing problem to as complex as accidentally deleting important system files. Most user related problems can be easily fixed or avoided with a little computer knowledge. 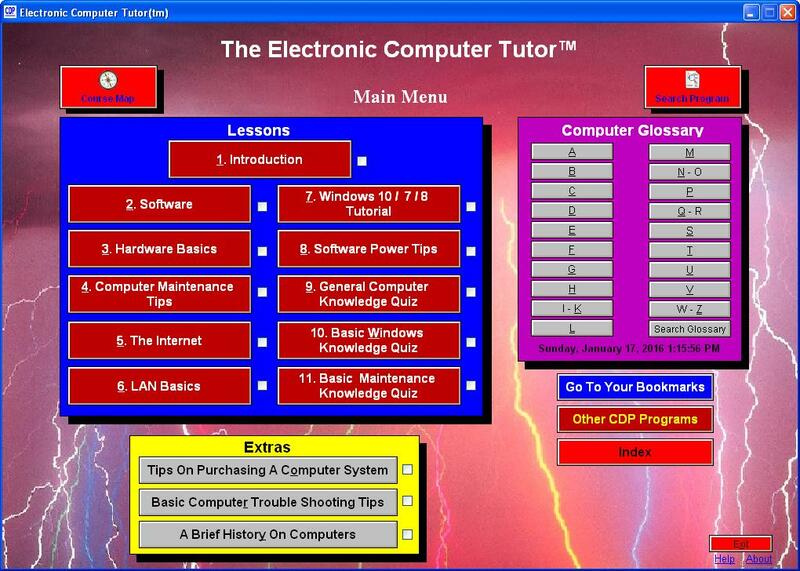 Thus, we have developed an educational computer program called "The Electronic Computer Tutor™." Our EducationWare program has helped many learn about their computer, common computer terms and vocabulary, computer maintenance, the Internet, and essential Windows basics. And it can do the same for you! Our program has a remarkably simple to use point and click user-interface that makes learning fun and easy. A computer glossary of the most used computer terminology. Often you will hear people at the office or computer stores throwing around computer terms and most in reality do not know what the terms truly mean. With our program, you no longer have to be in the dark wondering what the gurus are saying. A section on computer history. Get a good idea on how all this computerization came about. By knowing a little bit of the history, you can get a feel for where it is all going. A section on hardware. Click on what you want to learn more about and you will get a pop-up screen telling you about it or you will be taken to a screen with a much more in depth break-down. This will give you an appreciation for your computer as well as a much better understanding of how it works. A section about basic computer maintenance. Often, the problems that we as computer consultants encounter with our client's computers are related to a lack of proper maintenance. Applying simple maintenance to our automobiles, washing machines, A/C units, and everything else we own can make them last well beyond their initial warranty. With a few simple steps, your computer too can stay problem free for years. An Internet section. 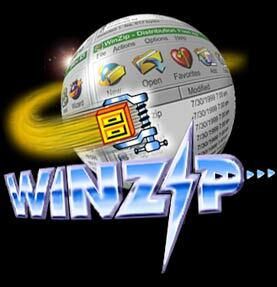 Learn what the Internet is about and such things as how to tighten up your Internet search. A Windows tutorial module. Our program teaches about Windows high points. Worried about Windows 10, Microsoft's latest operating system release? We cover Windows 10 highlights. A section that gives some power user tips for working with your computer and programs. In our consulting/training experience, most computer users are unaware of what their programs can actually do. A section on computer trouble shooting tips. All computers act up at one time or another. The vast majority of computer problems can easily be resolved with a little know how. A course map section that allows you to tailor a personal learning plan. Within our program, you can decide how you want to approach the information we present. Electronic quizzes that allow you to challenge your computer knowledge. Ask yourself, "Can I afford not to stay on top of the latest computer technology?" 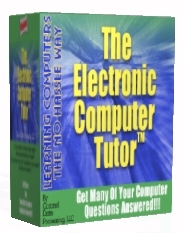 By ordering online today, we will deliver the program to you via a download link which means you can be up and running with the latest Electronic Computer Tutor™ version within 24 hours. By ordering online today, we will deliver the program to you via a download link which means you can be up and running with The Electronic Computer Tutor™ within 24 hours. 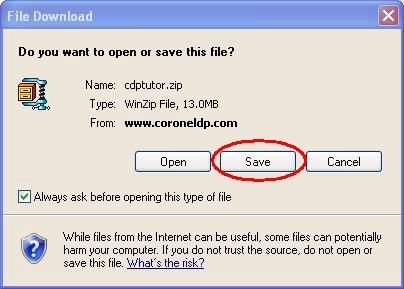 Go with the default settings and the program will be installed into a folder called C:\CDP\TUTOR. To run the program, click START-PROGRAMS-CDP-TUTOR or switch to the C:\CDP\TUTOR folder, and run the TUTOR.EXE program.